Reminder 5pm tonight. Free event unless you gamble. Great to see a big turnout. Perhaps the fan base expects another step forward, as we all do this year The scholarship award is a big deal. It's basically giving a $60k prize to a player that's been a walk on. Each year, that is the best thing that happens leading into camp! I'd like to see/hear coach Fritz's entire discussion about Brian. Imagine the phone call home to mom and dad telling them they're off the hook for $60k this year. Congrats! Does anyone have time to post a recap of what the coaches discussed? Not much insight from coach Fritz. Mostly introduced his staff and spouses along with a group of players. They had an auction as well. Overall a good time and well attended. Awesome story. I love the call he has with his dad, it evokes a lot of emotion. I don’t know if it was incompetence or taking another shot at us but the TP writer says it was announced in front of “. . . 12 other senior football players, the full 10-man assistant coaching staff and several other team supporters at a fundraising event at Boomtown Hotel. . .” I assume there were more then “several” team supporters in the room ? Couldn’t they have simply said a room full of supporters at boomtown ? A crowd full of supporters ? 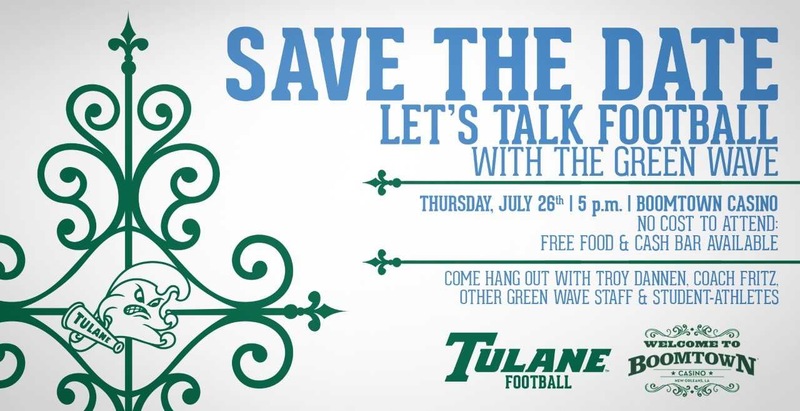 We know which writer didn’t go to Tulane . . . .
That's getting a little "picayune" IMHO! The fact that TP gave it any coverage is a step up from what's been happening lately. Troy did make a comment on the lack of media coverage. He said the media that does cover us during the year will get credentials to our bowl game. The others will be evaluated.